Tony's Talking Pictures Blog: Tony's Movie Reviews for April 14, 2017 "Fate of the Furious" and "The Lost City of Z"
Tony's Movie Reviews for April 14, 2017 "Fate of the Furious" and "The Lost City of Z"
The film tells the tale of tells the incredible true story of British explorer Percy Fawcett, who journeys into the Amazon at the dawn of the 20th century and discovers evidence of a previously unknown, advanced civilization that may have once inhabited the region. Despite being ridiculed by the scientific community, Fawcett returns time and again to his beloved jungle in an attempt to prove his case, culminating in his mysterious disappearance in 1925. The film takes us on 3 journeys into the jungle with Fawcett. However, the audience never learns much from these explorations and doesn't lend itself to engaging the viewer. Also the film has a problem in relaying the passage of time, leaving the viewer bewildered as to how much time has passed between explorations. 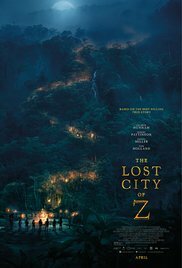 In the end, “The Lost City of Z” is a passionless adventure. It gets a C and is rated PG-13. A mysterious woman seduces Dom into the world of crime, he can't seem to escape and must betray those closest to him. The team will face trials that will test them as never before. From the shores of Cuba and the streets of New York City to the icy plains off the arctic Barents Sea, the elite force will crisscross the globe to stop an anarchist from unleashing chaos on the world's stage. “Fate of the Furious” marks the 8th chapter in the “Fast & Furious” series. The film offers no new twists or turns for the gang, as Dom (Vin Diesel) goes rogue and forces the team to use their special skills to track him down and stop him before a deadly weapon is delivered. Fans of the franchise will get exactly what they are expecting as the film delivers some good high-speed stunts, great cars and tough-guy lines, but the film stays squarely in it's comfort zone. “Fate of the Furious” gets a B and is rated PG-13. Catch all of the "Fast & Furious" films on NetflixDVD now and get a FREE month!